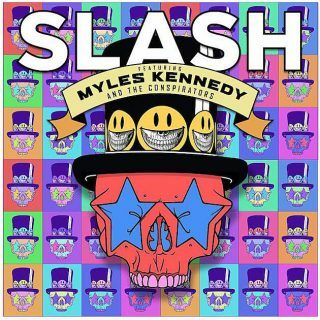 Slash Featuring Myles Kennedy And The Conspirators : Living The Dream album download | Has it Leaked? Living the Dream is the upcoming third studio album billed to the American band Slash featuring Myles Kennedy and The Conspirators, consisting of Guns N' Roses guitarist Slash and his backup band, and is scheduled to be released on September 21, 2018; it will also act as Slash's fourth solo album. On this album, Slash is joined by Alter Bridge frontman Myles Kennedy, bassist Todd Kerns, drummer Brent Fitz, and rhythm guitarist Frank Sidoris. The release is Slash's first since embarking on the Guns N' Roses Not in This Lifetime tour and will be produced by Michael "Elvis" Baskette. Good guys Slash and Myles. A very talented band, that’s for sure. One of the greatest guitarists and one of the greatest vocalists with a very solid rhythm section.